Mary Charlotte Greene, known to the family members as Polly, was born in Takeley, Essex in 1860. She was a delicate child and, as a result, had little schooling. Her passion was painting and she spent some time studying art at the Colarossi Academy in Paris where she lived with her younger sister Helen. She also trained at the Royal Academy in London. However, as her mother became interested in village affairs, so did Mary and she became happier. She started to teach art to four children once a week at The Old Vicarage in Grantchester. She walked each way, claiming that the Harston to Trumpington road was lonely, bare and treeless with no hills on either side to break the wind and no rise higher than the Gog Magogs eastwards until the Ural mountains break the great Russian plain. 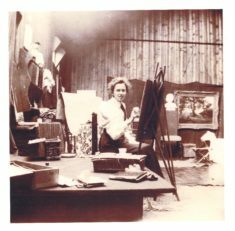 She established a studio off St Andrew’s Street where she held many exhibitions. She was a member of the Cambridge Drawing Society from 1894-1929 and its President from 1926-29. She had at least one exhibition in London as she recounts the tale of when her paintings were transferred to London in a lorry owned by Mr Seagrave (of Harston) who she accompanied in the lorry with her two Swedish helpers. She taught Charles Darwin’s granddaughter, Gwen Ravarat, who became a leading wood engraver. In Cambridge, her early paintings were watercolours of landscapes, buildings, backstreets and old courtyards, many of which have disappeared. Many of these are housed in the Cambridge Folk Museum and the Cambridge Collection. Others are in private hands, some still in Harston. 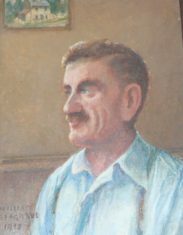 She also produced portraits of Harston residents and drawings of Harston buildings. She spent much time sketching and painting at Coe Fen in Cambridge. It has been claimed that her passion for the place influenced the Local Authority who agreed to preserve its rural aspect. By now she had started to travel to Cambridge in a chaise which had been bought for her mother. It was only about nine inches from the ground and pulled by a slow, fat pony called Peggy. Later still she relied on the bus as her sight had failed in one eye and she was also very deaf. She continued to paint and draw up to the end of her life but the scale and scope was much reduced as she concentrated mainly on sketches of children, animals and trees and flowers in her garden. Her nephew, the author Graham Greene in his book A Sort of Life describes her as ‘dear muddled-headed Polly who painted bad pictures and wrote ambitious plays for the village institute (the whole conflict between Christianity and Paganism in Northumbria she managed to contain in a one-act piece with fifty characters).’ This description is probably unfair but does highlight the other element of Mary’s life – her contribution to Harston village. Mary and her sister Helen became leading figures in supporting village activities, the first of which was to raise funds for a village hall. Helen wrote and produced plays whilst Mary wrote the songs, painted the scenery and dressed the actors. Larger scale pageants followed and Mary wrote a fairy play to suit the Harston House garden and the following year, a haunted one to suit the Manor House garden. Mary wrote the words for subsequent pageants based on village history. Mary said that their efforts raised a considerable sum towards the building of the village hall, completed in 1923. Shortly after this, Mary fell ill and had to remain in bed for two months. During this time she wrote a series of one act plays about an episode in a famous painter’s life (can scan programme). She also wrote plays and prologues which were performed to raise funds for the newly formed branch of the Women’s Institute. Some residents remember Mary setting painting competitions for Harston school children. 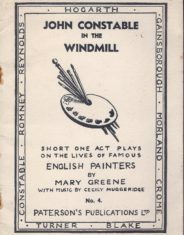 Val Joslin remembers Mary and her cousin Graham Greene setting painting competitions in school. Despite a genuine lack of artistic ability she remembers winning a prize of a ‘half-crown’ (12.5p today) for a picture of a lighthouse and boat in a storm. Mary took a great interest in the garden of Harston House in which she, along with the other family members, had responsibility for a certain area, always under the watchful eye of the gardener, Ernest Northrop, who she describes as ‘its despotic ruler’. Mary’s area was the dell with its woodland. She also designed four of the wrought iron gates in the garden, all made by the village blacksmith, Harry Lawrance. Mary died on 17 December 1951 and is buried with her sister Helen in Harston churchyard. Hello! I was greatly interested in this item, as I am currently studying the archives of the Cambridge Drawing Society and Mary Greene is often mentioned in the documents I am looking at. This item says that she was a member of the CDS until 1929 but I think this must be incorrect, as I have documents which show that she was a member at the time of her death in 1951. The Society’s spring exhibition featured a display of a number of her paintings, in memoriam. I’ll look more closely at the records and see what else I can find out about Mary’s membership of the CDS.